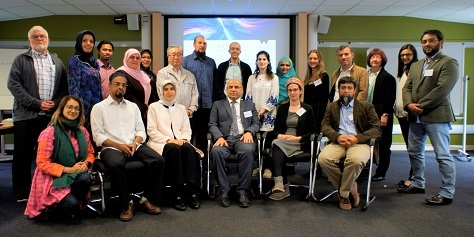 The 3rd Warwick Islamic Education Summer School brought together an enthusiastic group of researchers, practitioners, and community activists representing diverse social, national, educational and linguistic traditions for three days of presentations, workshops and discussions. Dr Abdullah Sahin, Reader in Islamic Education in the Centre for Education Studies, was joined by two colleagues in convening this year’s summer school: Fatimah Ashrif of Rumi’s Circle and Elif Medeni, Director of Islamic Institute at the University College of Teacher Education in Vienna, Austria. Formal presentations explored the theological, cultural, socioeconomic and political dynamics informing the gender inequality and lack of female leadership in educational and religious institutions in Muslim minority and majority societies. Young researchers appreciated the opportunity to receive detailed feedback from senior academics and scholars. Delegates also took part in practical workshops and case studies exploring the nature of female spirituality in Islam, the role of gender in reading sacred texts, under representation of Muslim female academics in the higher education, recent developments in mainstreaming female teacher education in western Europe and diverse grassroots initiatives led by young Muslim females to empower, build resilience, educational and social capital to engage with the various challenges facing Muslim women in the modern world. The Summer School also celebrated the launch of Dr Bill Gent’s book on Madrassah Education, Muslim Supplementary Classes & Their Place in the Wider Learning Community: a Redbridge-based study, and enjoyed a special performance by the Khayaal Theatre Company, the first dedicated producer of professional English language theatre inspired by Muslim world culture and heritage, that celebrated the art of female story telling in diverse Muslim cultures. Dr Sahin added: “In reviving the Muslim educational tradition of ‘taaruf’ - openness to learning from one another - the Summer School facilitates a collegial academic space as well as an excellent networking opportunity for the participants. The delegates enjoyed being part of an open, inclusive and engaging conversation that all wished to carry it further. The Warwick Islamic Education Project is generously supported by the Randeree Charitable Trust. The University of Warwick is one of the first UK universities to recognise Islamic Education as an academic field of research and teaching. The Warwick Islamic Education Project aims to establish a hub of excellence in research and teaching on Islamic education, to open up professional development pathways for practitioners, and to encourage research-based, reflective practice in Islamic educational settings. It is part of the Warwick Religions and Education Research Unit (WRERU) within the Centre for Education Studies. The Project signifies a model university-community collaboration and aims to facilitate engagement with the educational challenges facing British and European Muslim communities, widening participation with mainstream higher education institutions, and contributing to the achievement of social cohesion and meaningful coexistence within the context of the modern world.